Between 1994 to 1996 I lived for ten months or so as a volunteer English teacher among the monks of Dzogchen Monastery in India, who were at that time mostly from the Kham region of East Tibet. It was then that I first realised the substantial gap between the pronunciation I had been learning from cassettes accompanying various Tibetan courses, which all used the standard Lhasa dialect, and what the people around me actually spoke. This was a frustrating experience for me. For want of any written materials that could help, I resorted to "translating" and very freely adapting parts of a Tibetan handbook that I happened to have with me (the "Textbook of Modern Colloquial Tibetan Conversations" by Tashi Daknewa assisted by Kenneth Liberman, TLWA, 1993) into Kham dialect with the help of several of the monks, who were at the same time rapidly picking up English in my lessons. 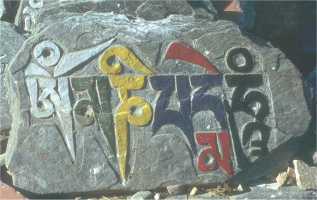 Some of the resultant material is included here, in the hope that it might prove of interest and use to others who find themselves in a similar position, although these days there are generally more resources available for students of Tibetan. I also include further conversation pieces as well as vocabulary lists of everyday items based on those that Tulku Dakpa Gyaltsen used for his informal classes in Brussels when he first visited there, with my thanks to him. I intend to continue adding to and amending this section over time, and if I ever get the opportunity to visit Kham myself, no doubt there will be extensive revisions as a result. To view or download this in pdf format click here and for an audio file of the three passages in Trehor dialect that start on page 35 click here . Linking directly to a file is not allowed - please link either to this page or to the home page.